The 49ers were aggressive but economical in the opening days of free agency. They secured potential franchise cornerstones while deeming them expendable if they underperform after one season. They took low-risk fliers on oft-injured players who have also achieved NFL success. With about $67 million in cap space entering 2019, the 49ers had the money to spend. No, they did not break the bank on Antonio Brown, Odell Beckham Jr., or Earl Thomas, players who required loads of guaranteed money. But the 49ers signed six former free agents, including Kwon Alexander, Jason Verrett, Tevin Coleman, David Mayo, Jordan Matthews, and Justin Vogel. The team’s splashy transaction was trading a 2020 second-round pick for Pro Bowl edge rusher Dee Ford. Now, the internal moves. The 49ers applied the franchise tag to Robbie Gould. They re-signed Kyle Nelson for four more years, Mark Nzeocha for three years, Mike Person for three years, Raheem Mostert for three years, Antone Exum Jr. for one year, and Jimmie Ward for one year. They restructured Malcolm Smith’s deal to keep him through the 2019 season. Pierre Garcon, Earl Mitchell, Garry Gilliam, and Cassius Marsh were all released. Brock Coyle retired after five NFL seasons. After all these moves, the 49ers spent around $53 million against their 2019 cap. Keep in mind the NFL only counts the top 51 contracts against the cap. The team also saved about $15 million in cap savings by releasing the aforementioned players. The NFLPA indicates the 49ers have $37.22 million in remaining cap space, the third-most in the league. Let’s break down how the 49ers’ spending in free agency has impacted their cap situation. Ford signed for five years, $87.5 million, but all $20.5 million in guarantees come in the first year. Ford’s $13.65 million in base salary for 2020 is only guaranteed if he stays with the team after April 1 of next offseason. If the 49ers release him, they would suffer just $6.4 million in dead money. Alexander signed a four-year, $54-million deal. At the time of his signing, his $13.5 million annual salary was the most ever for an inside linebacker. But a lot has to go right for Alexander to see all that money. His deal is front-loaded. All $14.25 million of his guaranteed money comes in the first year. The 49ers can choose to let Alexander go after Year 1, should he underperform. They would owe Alexander just $3 million if that is the case. If he stays for the entirety of his deal, his base salary will be $11.25 million in 2020, $12.55 million in 2021, and $12.65 million in 2022. The 49ers signed Verrett to a one-year, $3.6-million “prove-it” deal. Much of this contract (about $1.5 million in total) lies in per-game roster bonuses because Verrett has played in just 11 of potentially 50 games in three years due to injuries. He is coming off an Achilles tear suffered last July. This is arguably the most economical deal of the 49ers’ offseason. Coleman, coming off three straight seasons of 900-plus all-purpose yards, signed a two-year deal with a maximum of $8.5 million in earnings. Only $3.25 million is fully guaranteed, all in the first year. The specifics of these contracts have not yet been disclosed. Let’s estimate Matthews’ cap hit is $4 million, Mayo’s is $2 million, and Vogel’s is $1.5 million. Onto the players the 49ers retained from their 2018 team. The 49ers didn’t want to allow Gould, who made an NFL record 72 of 75 field goal attempts in the past two seasons, to walk. So, they used their franchise tag for the first time in seven years. Gould will make $4.97 million, all of which will count against the cap. The 49ers have stated their intentions to reach an extension with Gould, but for now, he will be a 49er for one more year. The 49ers fan base uttered a collective groan when the team re-signed Ward, whose only consistent attribute is being injured. The 49ers exercised the fifth-year option on Ward last year, making him the team’s highest-paid defensive player, despite his status as a backup. Ward is now San Francisco’s projected starter at free safety. The team extended him to a one-year, $4.5-million deal, with $3 million guaranteed. The 49ers signed Kyle Nelson to a four-year, $4.54 million extension. There is a clause in Nelson’s contract that protects the team if current starting long snapper Colin Holba plays well to start the year. Nelson will serve the final six games of his 10-game suspension — the longest in 49ers history — for using performance-enhancing drugs. The 49ers can part with Nelson after one year if Holba performs. The 49ers extended starting right guard Mike Person for three years, $8.25 million. He will make $2.45 million in guarantees. The cap hits of these contracts aren’t yet known, though NBC Sports Bay Area’s Matt Maiocco has reported some of the contract details. Mostert was originally set to make $2.03 million as the team exercised his restricted free-agent tender. But the sides agreed to a three-year deal last week for $8.7 million. The 49ers also extended Nzeocha, a standout special-teamer and rotational strong-side linebacker, to a three-year deal with $3.9 million in base salaries. Smith started in five games throughout the past two seasons due to injuries. From his original contract, he was set to make $3.75 million with a cap hit of about $5.4 million in 2019. But the 49ers recently restructured his deal, reducing his pay for the 2019 season. Let’s ballpark his 2019 cap hit around $2.5 million in 2019. The 49ers saved money by releasing expensive veterans, including Garcon ($1.08 million in cap savings), Mitchell ($2.95 million), Gilliam ($5.05 million), and Marsh ($5.1 million). Coyle’s retirement — a decision stemming from a back injury — saves the team about $1.45 million in cap savings. Here are the remaining cap hits for the players not on the 2019 roster: $7.2 million from Garcon, $2.36 million from Reuben Foster, $1.5 million from Mitchell, and $1.4 million from Coyle. The 49ers were active throughout the early stages of free agency, but they didn’t spend at the expense of their future. Restraining from paying big money to studs like Beckham Jr. and Thomas allows the 49ers freedom to retain their own stars in future years. The two players the 49ers most want to keep are George Kittle and DeForest Buckner, who will both carry hefty price tags if they continue to play at the Pro Bowl-level they showed in 2018. Unless the 49ers spend big on another free agent in the near future, which seems unlikely, they should have the money to pay Buckner after the upcoming season and Kittle after the 2020 season. It’s impossible to predict the specifics of these future contracts. But knowing the salary cap expands by about $10 million each year, and judging from current contracts, we can speculate. Defensive Player of the Year Aaron Donald will carry a $17 million cap hit in 2019. Baltimore’s Brandon Williams will have a $14.2 million cap hit, the fifth-most in the league for all defensive tackles. Let’s assume Buckner falls right around that number, considering a couple of offsetting variables: the increasing salary cap and 49ers contract specialist Paraag Marathe’s ability to protect the team. Onto the tight ends. Green Bay’s Jimmy Graham’s $12.67 million cap hit in 2019 is the most for all tight ends. Washington’s Jordan Reed will have a $9.67 million cap hit, the fifth-highest. If Kittle, who holds the single-season tight end yardage record, continues to perform, he will likely fall somewhere in the neighborhood between Graham and Reed. As it currently stands, the 49ers are in position to pay those franchise cornerstones. 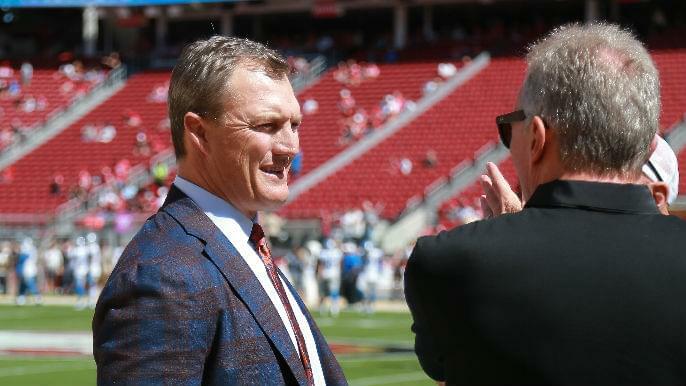 Spotrac estimates the 49ers have more than $35 million in 2020 cap space, but they will benefit from the rising salary cap and rollover from their $37 million in 2019 cap room. Subtract more than $9 million the team will likely distribute to its 2019 draft picks, and the 49ers should have anywhere from $65 to $70 million in cap space next year, about the same amount as this year. A successful year on the free-agent mill looks even better because it has positioned the team for the future.